Ukraine, the second largest of the former Soviet republics, will hold an early parliamentary election on Sunday, September 30, 2007 to choose members of the country's unicameral Parliament, the 450-seat Supreme Council or Verkhovna Rada. Since 2006, parliamentary seats are distributed on a nationwide basis by the largest remainder method of proportional representation among parties or coalitions polling at least three percent of the vote in the entire country. Legislative elections in Ukraine normally take place every five years, but the upcoming poll will be held nearly four years ahead of schedule, following a constitutional stalemate between the country's major political leaders: President Viktor Yushchenko and his arch-rival, Prime Minister Viktor Yanukovych, who made a political comeback in last year's parliamentary elections, after Yushchenko had defeated him in the re-run of the disputed 2004 presidential election. Ukraine declared itself independent in August 1991, in the aftermath of the aborted coup in the Soviet Union. The declaration of independence was confirmed the following December by 90.3% of the voters, in a referendum held simultaneously with a presidential election won by Leonid Kravchuk, a former Communist leader. However, Kravchuk's term in office was characterized by severe economic decline and runaway inflation, while privatization of the economy moved at a snail's pace. Less than five percent of production was fully in private hands by the time a presidential election was held in June 1994, in which Kravchuk was defeated by Leonid Kuchma, a Soviet-era industrial manager and former prime minister (1992-93) who advocated closer ties with Russia. Meanwhile, the reconstituted Communist Party of Ukraine had emerged as the largest party in parliamentary elections held earlier that year. Under Kuchma, Ukraine adopted a new constitution in 1996 that gave the president extensive powers and retained the unicameral legislature. Later that year, the hryvnia was introduced as the new currency, replacing the Ukrainian coupon (karbovanets) that had served as legal tender since 1992. However, in the 1998 parliamentary elections, carried out under a new electoral law which provided for the election of half the deputies by party-list proportional representation (with the remaining half chosen in single-member districts), the Communists were again the largest party, and relations between the president and the legislature remained tense. Although corruption represented a major problem and Ukraine's economy continued to struggle, Kuchma was re-elected in 1999, defeating Communist Party leader Petro Symonenko in an election generally regarded as less than exemplary, given the government's tight control over the media and other abuses, such as the intimidation of candidates and their supporters. 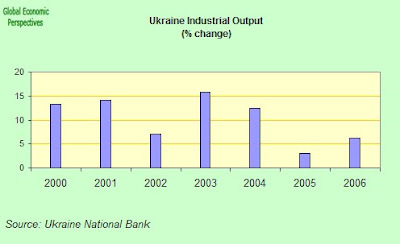 Ukraine's economy began to experience sustained growth in 2000 under a program of economic reforms initiated by Viktor Yushchenko, Kuchma's newly appointed prime minister. However, the following year Kuchma dismissed the increasingly popular Yushchenko as head of government. In the 2002 parliamentary elections, the opposition bloc Our Ukraine, led by Yushchenko, emerged as a major challenger to Kuchma's increasingly authoritarian and corrupt government, winning the largest number of votes and seats in the proportional representation ballot, ahead of the Communist Party and the Kuchma-sponsored For a United Ukraine bloc. Nonetheless, the conduct of the elections left much to be desired, and several parties - Our Ukraine among them - protested the use of bribery and intimidation by the government during the election, as well as the perceived manipulation of election results. Despite its third-place finish in the proportional vote, For a United Ukraine won the largest number of single-member seats; it became the largest parliamentary party after a number of independent deputies joined its ranks, and the government was subsequently able to secure a parliamentary majority. President Kuchma, who appeared to be implicated in the 2000 murder of prominent journalist Georgiy Gongadze - the so-called "Kuchmagate" - chose not run for re-election in 2004. Instead, he endorsed Prime Minister Viktor Yanukovych, a former governor of the Donetsk region in eastern Ukraine and the leader of the Party of Regions. Meanwhile, Viktor Yushchenko emerged as the main opposition candidate, supported by Yulia Tymoshenko, Yuschenko's former deputy prime minister and the leader of the eponymous bloc, which had emerged as the fourth largest party in the 2002 legislative election. The campaign was far from free and fair, despite assurances to the contrary by the authorities: Yushchenko was physically prevented from campaigning in Donetsk as well as other eastern cities, and the government mobilized its resources in favor of Yanukovych, in open violation of the law. Nationwide media in Ukraine were largely controlled by oligarchs with close links to the government, and the latter issued temnyky or guidelines to control the content of media broadcasts during the course of the election campaign. Not surprisingly, Yanukovych's coverage was overwhelmingly positive, while Yushchenko was depicted as an extremist; moreover, Yanukovych received more television coverage than all the other candidates put together in the months preceding the election. In September, Yushchenko fell seriously ill as a result of dioxin poisoning (allegedly at the behest of Ukrainian authorities), which left his face scarred. Meanwhile, Russian President Vladimir Putin openly supported Yanukovych - as did the Russian media, which campaigned strongly against Yushchenko. A total of twenty-four candidates took part in the October 31 first round of voting, which international observers criticized as falling well short of democratic standards. According to official results released ten days later by Ukraine's Central Election Commission (CEC), Yushchenko narrowly outpolled Yanukovych by 0.6% of the vote; Oleksandr Moroz, leader of the Socialist Party of Ukraine, and Petro Symonenko of the Communist Party trailed far behind in third and fourth place, respectively. With 39.9% of the vote, Yushchenko fell short of an absolute majority, and a runoff election was held on November 21. While independent exit polls indicated Yushchenko had won the second round by a sizable majority, the CEC declared Yanukovych the election winner by a margin of just under three percentage points. However, some of the figures released by the Commission were suspect: for example, in Yanukovych's home region of Donetsk, turnout jumped dramatically from 78.1% in the October 31 vote to an extremely high 96.6% (by comparison, the nationwide voter turnout rate was reported to have increased from 74.5% in the first round to 80.4% in the runoff vote). Russia and Belarus rushed to recognize Yanukovych's "victory," but the United States and the European Union (EU) declared the election fraudulent. Meanwhile, Yushchenko's supporters organized mass protests against the election fraud attempt, bringing together millions of citizens to Kyiv (Kiev) over the course of the following two weeks in a series of peaceful rallies that became known as the "Orange Revolution," after Yushchenko's campaign color. In early December, the Supreme Court invalidated the results of the November 21 vote and ordered a second runoff. The CEC was replaced, and Parliament - which for good measure had also declared the runoff election results to be invalid - amended the electoral law to prevent uncontrolled absentee balloting and false voting at home, both of which had been identified as election fraud tools. In the December 26 election re-run, closely monitored by Organization for Security and Co-operation in Europe (OSCE), Yushchenko won a decisive victory with 52.0% of the vote to Yanukovych's 44.2%, on a 77.2% turnout; Donetsk region reported a turnout rate of 84.2%. However, the East-West division was not a new phenomenon in Ukrainian politics. In the 1994 and 1999 presidential elections, central and western Ukraine - the latter of which had been part of Poland (or Czechoslovakia in the case of Transcarpathia) between the two world wars - voted for the candidate perceived as least close to Russia (Kravchuk in 1994, Kuchma in 1999; Serhij Vasylchenko's website has election maps for both events). Although OSCE concluded that Ukraine had taken "a great step forward toward free and fair elections," Yanukovych challenged the validity of the results. Nonetheless, the Supreme Court rejected his appeal and Yushchenko was sworn in on January 23, 2005. Once in office, President Yushchenko appointed a coalition cabinet composed of Our Ukraine, the Yulia Tymoshenko Bloc, the Socialist Party of Ukraine and the Union of Industrialists and Entrepreneurs, with Mrs. Tymoshenko - Yushchenko's Orange Revolution ally - as the country's first female prime minister. However, the new government ran into trouble very quickly. The Ukrainian economy, which had been growing strongly, slowed down abruptly. Rival groups emerged within the ruling alliance, and engaged in an increasingly bitter in-fighting, while President Yushchenko came across as thin-skinned when dealing with media criticism of family members and close associates. In September 2005, Yushchenko dismissed his entire cabinet - Prime Minister Tymoshenko included - accusing it of incompetence. To the dismay of many of his supporters, Yushchenko then reached an agreement with his former presidential adversary Viktor Yanukovych over the appointment of Yury Yekhanurov as prime minister. President Yushchenko sought closer ties with the West - he had promised that Ukraine would take immediate steps to join the EU and the North Atlantic Treaty Organization (NATO) - but there was little progress in negotiations with the EU, and NATO membership remained a divisive issue in Ukraine. Meanwhile, relations with Russia deteriorated markedly. Russia regards Ukraine as part of its "natural" sphere of influence, and very much resented what it regarded as Western interference in the 2004 presidential election. In some ways, Ukraine's situation with respect to Russia is similar to that of the Baltic republics (which also broke away from the Soviet Union in 1991), but there are important differences. Like Estonia and Latvia, Ukraine has a large ethnic Russian minority (concentrated in the eastern part of the country and the Crimean peninsula) that constitutes about one-sixth of the population. However, unlike the national languages of the Baltic countries, Ukrainian is a Slavic language closely related to Russian, and the two languages are mutually intelligible. In fact, more than a decade-and-a-half after independence, Russian remains the first language of approximately thirty percent of Ukraine's population. To be certain, the status of the Russian minority and the Russian language in Ukraine has been at times a point of contention with Russia, but there is far less animosity over either issue than in the Baltic nations, and relations between the Ukrainian and Russian ethnic communities are generally good. During the 2004 presidential election crisis, Parliament approved constitutional reforms that shifted certain powers from the president to Parliament. Although opposition parties had defeated an earlier attempt by Kuchma's outgoing government to limit the powers of the presidency, the reforms were accepted by Yushchenko's supporters as a "grand compromise" to lower the stakes of the presidential election re-run and make Yushchenko's anticipated victory more palatable to his opponents. Under the reforms, effective as of January 2006, the president no longer has the right to dismiss the cabinet, which is now responsible to Parliament. Meanwhile, the prime minister is appointed by the president on the recommendation of the party or parties holding a parliamentary majority, and the appointment must be confirmed by Parliament, which also appoints and dismisses cabinet ministers as proposed by the prime minister. However, the president retains the constitutional right to appoint the defense and foreign ministers, as well as the head of the security service. The president also retains the right to veto legislation, with the exception of constitutional laws, and may stop cabinet decrees, provided the decisions are endorsed by the Constitutional Court. Thus, the constitutional reforms established what political scientists would refer to as a semi-presidential form of government. The introduction of a fully proportional electoral system with a nationwide three percent threshold reduced the number of parties represented in Parliament to five. Viktor Yanukovych and his Party of Regions, which ran a professional campaign advised by American political consultants, staged a major comeback and topped the poll, while the Yulia Tymoshenko Bloc tripled its share of the vote and became the largest party on the "Orange" side of the political spectrum. On the other hand, the election was a major setback for President Yushchenko: Our Ukraine had a poor third-place showing, symptomatic of the widespread disenchantment with a government that had failed to improve living standards and tackle corruption effectively. Finally, the once-powerful Communist Party was largely eclipsed by the Party of Regions, barely managing to overcome the three percent barrier. The elections were generally regarded as free and fair. Unlike in previous elections, the government neither interfered in the election process nor attempted to control the media. The Orange Revolution may not have improved the lot of the average Ukrainian, but it paved the way for the development of a true (if by no means perfect) electoral democracy in Ukraine - in stark contrast to neighboring Belarus (which slid into outright dictatorship) and Russia (which had drifted into a distinctly authoritarian "managed democracy") - and the days of election fraud, government censorship and politically motivated murders were certainly over. 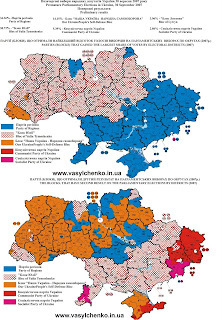 The map on top, which shows the majority party in each election district, clearly indicates that the west and the center went for Our Ukraine (orange) or the Yulia Tymoshenko Bloc (yellow), while the Party of Regions (blue) prevailed in the east and south, although it scored a handful of victories outside its home base. However, the bottom map - showing the second largest party in each district - presents an interesting picture: while Our Ukraine and the Yulia Tymoshenko Bloc were almost invariably the two largest parties in the west, in central Ukraine the Party of Regions competed with Our Ukraine and the Socialists (pink) for the second spot. More importantly, in eastern and southern Ukraine the Yulia Tymoshenko Bloc arrived second in most cases, except in Donetsk, Luhansk and Crimea (excluding Sevastopol). In the former two, the People's Opposition Bloc of Natalia Vitrenko (brown) and the Communist Party (red) competed for second place, while in the latter Our Ukraine finished second, with the Yulia Tymoshenko Bloc right behind. In all, the Yulia Tymoshenko Bloc managed to obtain a substantial number of votes throughout the entire country, with the exception of the Donets Basin. Negotiations leading to the formation of a new government extended over the course of the following months, and by June it appeared the "Orange" parties - Yulia Tymoshenko Bloc, Our Ukraine and the Socialists - would form a coalition government headed by Mrs. Tymoshenko. However, at the last minute Socialist Party leader Oleksandr Moroz abandoned his erstwhile allies and cut a deal with the Party of Regions and the Communists in a coalition that made him speaker of Parliament and Yanukovych prime minister. In August President Yushchenko agreed to the appointment of Yanukovych as head of government; the only alternative would have been to call an early parliamentary election. However, the 2004 constitutional amendments were highly ambiguous regarding the division of power between the president and the prime minister, and Yanukovych quickly sought to define his powers (and those of Parliament) in the broadest possible manner, to the detriment of the presidency. For example, in December 2006 Parliament sacked Foreign Minister Borys Tarasyuk - the architect of Yushchenko's pro-Western policy - but the president made it clear that it was his prerogative to remove the foreign minister since he nominated him, and he ordered Tarasyuk to continue in his job. Although the constitution does not specify how ministers appointed by the president can be dismissed, Tarasyuk was nonetheless barred from attending subsequent cabinet meetings, and in late January 2007 he tendered his resignation. Unfortunately, the amended constitution failed to provide conflict resolution mechanisms, and the result has been an intense power struggle between President Yushchenko and Prime Minister Yanukovych. In April 2007, President Yushchenko dissolved Parliament and called an early election for May 27, after talks with the leaders of parliamentary factions failed to resolve the political crisis, which has paralyzed the government. Initially, Prime Minister Yanukovych was staunchly opposed to the early poll, but the following month he reached an agreement with Yushchenko to hold the parliamentary election on September 30. Despite the ongoing constitutional crisis, the Ukrainian economy posted strong gains in 2006, and Prime Minister Yanukovych is running on his government's economic record, while playing down his party's policy in favor of closer ties with Russia. A total of twenty parties or blocs will take part in the election, but only four or five appear likely to secure representation in the Supreme Council: the Party of Regions, Yulia Tymoshenko Bloc, Our Ukraine-People's Self-Defense, the Communist Party and possibly the Lytvyn Bloc; the Socialist Party is widely expected to lose its parliamentary representation. Nonetheless, opinion polls suggest the election outcome will not be significantly different from last year's vote: the Party of Regions is all but certain to come in first place, followed by the Yulia Tymoshenko Bloc and Our Ukraine-People's Self-Defense; the latter two have set aside their past differences, and their combined electoral support appears to be slightly above the Party of Regions' poll numbers. As such, the result may hinge on whether or not the Communists or the Lytvyn Bloc win enough votes to overcome the three percent threshold, and it remains far from clear that the elections will put an end to the year-long, constitutional tug-of-war between Ukraine's pro-Western president and his pro-Russian prime minister. Ukraine's Central Election Commission (CEC) is publishing live 2007 election results in both Ukrainian and English. In addition, there were 637,185 votes (2.7%) cast against all parties. The election had a 62% voter turnout rate, down from 67.6% in 2006. 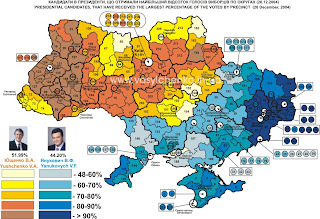 However, the maps clearly show how the Yulia Tymoshenko Bloc outpolled Our Ukraine-People's Self Defense nearly everywhere in western and central Ukraine, with the notable exception of Transcarpathia. Although Prime Minister Yanukovych's Party of Regions had the largest share of the vote, the pro-Western parties (Yulia Tymoshenko Bloc and Our Ukraine-People's Self Defense) won a total of 228 mandates, for an overall majority of six seats. As noted at the beginning of this posting, Supreme Council seats are allocated by the largest remainder method of PR. Under this system, the total number of votes polled by parties entitled to participate in the distribution of seats is divided by the total number of parliamentary seats (450) to obtain an election quota (the Hare quota). Then, the number of votes polled by each qualifying party is divided by the quota, and the integer part of the division is the number of seats assigned to the party. If there remain unfilled seats, these are allocated to the parties with the largest fractions or remainders. According to final results issued by the CEC, the five parties or blocs polling at least three percent of the vote received a seat for every 45,909 votes. The apportionment of seats by the full Hare quota allocated 448 mandates, leaving two seats to be assigned according to the largest fractions: one for Our Ukraine-People's Self Defense (on a large fraction close to the quota) and the final seat for the Party of Regions (at the expense of the Communists). Meanwhile, the Socialist Party finished just under the three percent minimum required to obtain parliamentary representation. Had the Socialist share of the vote reached the threshold, the "Orange" parties would have fallen short of an absolute majority. The narrow parliamentary majority secured by the Yulia Tymoshenko Bloc and Our Ukraine-People's Self Defense is too small to form a long-lasting government, and one party which might come into play is the bloc headed by former speaker Volodymyr Lytvyn, who had been a close associate of President Kuchma until he switched sides in 2004 to support Viktor Yushchenko. Lytvyn had previously indicated he might support either the pro-Western or the pro-Russian parties, in all likelihood anticipating his party would overcome the three percent threshold it narrowly missed in 2006, and hold the balance of power after the election. At it was, the Lytvyn Bloc did secure parliamentary representation this time around, but the failure of the Socialists to overcome the electoral barrier left the "Orange" parties in the majority. Nonetheless, the Lytvyn Bloc could provide the winning parties a much more comfortable majority of 46 seats. Meanwhile, President Yushchenko has called for "co-operation" between the pro-Western parties and Yanukovych's Party of Regions, even suggesting that the latter be offered cabinet positions in an "Orange" government. Although the president is ostensibly concerned about Ukraine's national unity and stability, he is probably worried as well about giving too much power to Mrs. Tymoshenko - who is regarded as a likely rival in the 2009 presidential election, particularly after her party's strong showing in the recently held parliamentary election. Nonetheless, following the announcement of final results on Monday, October 15, the leaders of the Yulia Tymoshenko Bloc and Our Ukraine-People's Self Defense signed an agreement to form a coalition in the newly-elected Supreme Council. On Thursday, November 29, the two parties officially established a "Coalition of Democratic Forces" parliamentary majority. The agreement, signed by all but one of their 228 deputies, paved the way for the return of Yulia Tymoshenko as prime minister, while Our Ukraine-People's Self Defense nominated the speaker of the Supreme Council. A week after coming up one vote short of an absolute majority, Yulia Tymoshenko's appointment as head of government was finally confirmed by a parliamentary majority of one on Tuesday, December 18; the opposition parties boycotted the vote. Whoever, at the end of the day, wins the elections which are being held in Ukraine today, one thing is certain: they will have their work cut out, since Ukraine is a country with a very large accumulated set of problems, and of course, its size (in a European context) means that it is also a country which few (and especially those countries in the European Union) can afford to ignore. What I will present below is a general review of the state of the Ukraine economy - which is at the surface level a lot healthier than many perhaps expect - but it will do this in a specific context, that of the inflation and labour supply problem which currently besets the emerging economies of Eastern Europe as a whole (and indeed see this systematic analysis of a very similar situation which exists in neighbouring Romania only last week). Now earlier this year the World Bank published a very comprehensive report on the demographic future of Eastern Europe and Russia entitled "From Red to Gray - The Third Transition of Ageing Populations in Eastern Europe and the former Soviet Union". The key topic addressed in this report was the impact of long term low fertility on Eastern Europe's ageing labour force. The World Bank offered three policy remedies, more labour productivity, higher participation rates, and more migration. If measures are taken to improve labor productivity, this would clearly outweigh the losses due to a smaller labor force. Output in aging countries can also receive a boost from increases in labor force participation through raising retirement ages and encouraging flexible forms of employment. And politics permitting, shortfalls in labor supply can be minimized by interregional migration. The first of these is evident, but involves a fairly long term process to raise the education level and human capital content of the entire Ukranian population. It is the other two, the potential of increased participation rates and internal CIS state migration processes to resolve (or at least mitigate the problem) which will be examined here. In this sense Ukraine may be considered to be rather an important strategic unit in the whole Eastern labour supply and demographic puzzle, since many imagine that as labour supply runs out across the whole region, then countries as diverse as the Baltics, Poland, Hungary, the Czech Republic and Russia may all . and at one and the same time - be able to leverage Ukraine's population reserve to help them out of their own difficulties. In this sense many live in the hope that outward flows from Ukraine may serve to plug a lot of otherwise increasingly evident holes in the East European labour force. My feeling is that the people who make this kind of projection for the Ukraine tend to forget three things. 3) That these sending countries, and in particular as a result of the processes detailed in (1) and (2), themselves start to experience fairly high rates of economic growth, and as a result they themselves start to need migrants. Ukraine is now a classic case of this process at work. 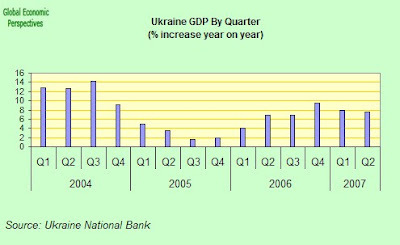 1) The Ukraine economy has itself been growing quite rapidly in recent years (despite a slowdown in 2005). It grew at an annual rate of nearly 7% last year, and was growing at an annual rate of nearly 8% during the first six months of 2007. This reasonably strong performance is also reflected to some extent in the annual rates of increase of industrial output. And again the healthy tendency has continued throughout 2007. 2) As a result of this more rapid growth employment is growing moderately, but as a result of the ageing labour force unemployment is coming steadily down and was at 6.8% of the labour force using ILO criteria in 2006, while the number of those registering as unemployed in August 2007 was down to only 595,000. Wage inflation, on the other hand, was running at an annual rate of increase of 11.2% in the period Jan-Aug 2007 when compared with the same period in 2006. What we can deduce from the above is not that people will stop leaving the Ukraine for the west - this is unlikely to happen, since the wage differential is just too large - but rather that the Ukraine economy will itself need to import labour if it wishes to continue to grow at the present rate. And this problem is real, and exists in the here and now, and is not a hypothetical situation set to arrive in 2025 or some other more-or-less-exotic date in the future. I am putting things this way as I imagine much of the above will come as some sort of surprise to many people. So Ukraine is not a bottomless pit as far as labour supply goes, and the question is why? 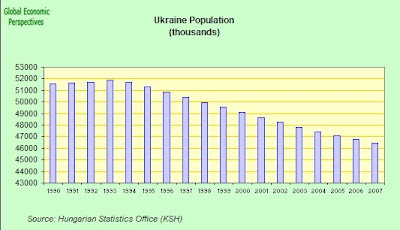 Firstly lets look at the Ukraine population. 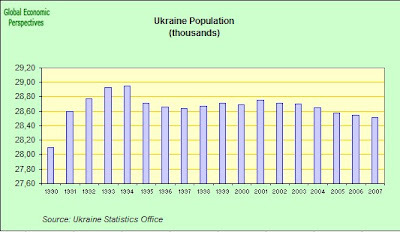 As we can see the Ukraine population peaked in 1993, and has been in some sort of free-fall ever since. 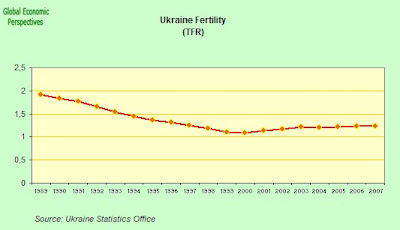 Now there are a number of factors which lie behind this dramatic decline in the Ukrainian population, and one of these is fertility, which is currently in the 1.1 to 1.2 Tfr range. As we can see below, Ukraine's fertility actually dropped below the 2.1 replacement level back in the 1980s. 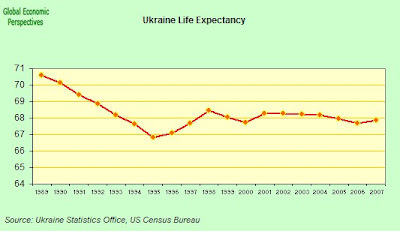 A second factor which influences population size is life expectancy, and in the Ukraine case the recent evolution of life expectancy has been most preoccupying, since it has been falling rather than rising. The chart below shows life expectancy at birth for both men and women, the male life expectancy is evidently significantly below the combined figure. This situation is, as well as preoccupying, highly unusual (it is however paralleled to some extent in Russia itself). 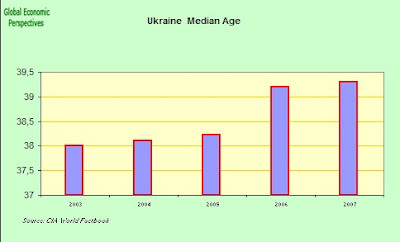 Apart from the obvious, the deteriorating health outlook which this data reflect places considerable constraints on the ability of a society like Ukraine to increase labour force participation rates in the older age group, and this is a big problem since this is normally though to be one of the princple ways to compensate to some extent for a shortage of people in the younger age groups. As can be seen the balance of birth and deaths, or natural rate of increase in the population without taking immigration into account, turned negative in the early 1990s. It is very hard to see how this situation can right itself, certainly at any point in the coming half century. One of the key factors to think about in the economic context are the actual numbers of live births, rather than the more complex measures of fertility. In 1989 - which is the earliest year for which I have access to data - there were nearly 700,000 children born. By 1998 this number was near to 400,000 (ie a 40% or so drop in a decade). In practical terms (and if we take 18 as an average age for labour market entry in a country like Ukraine) then this year there are potentially 700,000 people to enter the labour force, while by 2016 this number will be only 400,000. Even if some of this loss can be offset by increasing labour force participation at the older ages this still implies a sharp rise in the average age of the workforce. This is just one of the reasons why fertility matters. And in this context I am not optimistic about any large scale recovery in fertility in Ukraine in the forseeable future simply because of the comparatively low mean mothers-age at first birth which exists in the Ukraine. The reasoning behind my opinion here is explained in this paper: The path to lowest-low fertility in Ukraine, by Brienna Perelli-Harris. According to Perelli Harris, although Ukraine has undergone immense political and economic transformations in the past decade, it has maintained a comparatively young age at first birth and nearly universal childbearing. Her analyses of official national statistics and the Ukrainian Reproductive Health Survey show that fertility declined to very low levels without a transition to a later pattern of childbearing. That is to say - and for those of you who are familiar with the birth postponement process and the importance of the tempo-quantum distinction - the Ukraine still has a very low mean age at first birth by European standards (around 23 as contrasted with the West European average mean-age which is currently near to 30) and thus very probably has many more years of birth postponement (and with this a reduced number of recorded live births) in front of her. In other words Ukraine still has a long way to go in the current demographic transition, and as a result a real improvement in the birth rate may not be expected till average first birth ages have settled at a new, and much higher, level. We could be talking about a couple of decades here, at a rough guess. So even if, as we can see from the above graph, there has been a small increase in the number of births in the last few years, it is hard to attach any real importance or significance to this. In large part fluctuations in annual birth levels during epochs of substantial postponement are shadows of earlier fluctuations in the level of annual births, fluctuations which are now reflected in the numbers of potential mothers. 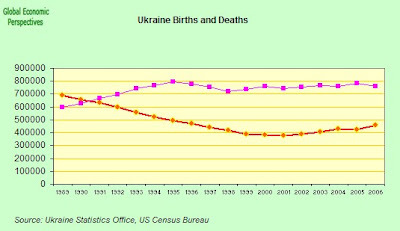 On the other hand, and as I have noted above, while Ukraine has one of the lowest fertility levels in Europe, it also has one of the highest death rates. In 2000, for example, the death rate reached 15.3 per 1,000 as compared with a 10.6 per 1,000 average rate for the countries of the European Union. Between 1991-2000 an increase in the death rate was recorded in practically all age groups (with the exception of the 1-14 age group), but this increase was especially pronounced among working age males. The death rate for the working-age group grew by a factor of eight in the years between 1991 and 2000, and the portion of the overall death rate which came from the working age group reached almost twenty-five percen. In all but the oldest-old age groups the death rate for men significantly exceeds the death rate for women (and in some cases by a multiple of two or three), but the difference is especially noticeable in the 30-45 groups - ie in ages which still fall within the boundaries of the reproductive age. The third factor influencing population dynamics is obviously migration. We can break the evolution of migration in the Ukraine context into three phases. The first of these covers the period of 1991-1993, the second runs from 1994-1998, while the third started in 1999 and is ongoing (I owe this classification to the work of Olena Malynovska, see reference below). The first phase followed the break-up of the old Soviet Union and was characterized by massive migratory movements - or so-called stress migration processes. 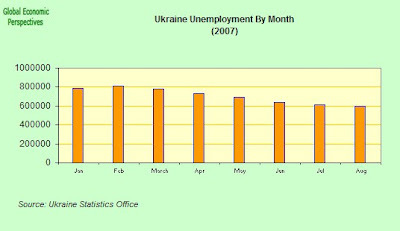 During this phase, there was a strong migratory surplus into the Ukraine. Such migratory growth was primarily driven by Ukrainians who wanted to live in their own country and who were repatriating themselves from the North of Russia, the Far East and Kazakhstan, as well as repatriation of those previously subject to repression and exile such as the Crimean Tartars. In the forefront of this was a large influx of both Ukrainians and indigenous population fleeing conflicts in Central Asia and Transcaucasia. To give an example of the very large migratory surplus in 1992 60% were ethnic Ukrainians. On the other hand among emigrants ethnic Ukrainians constituted only 37.7 % of the total in 1991 and 28.8% in 1992. 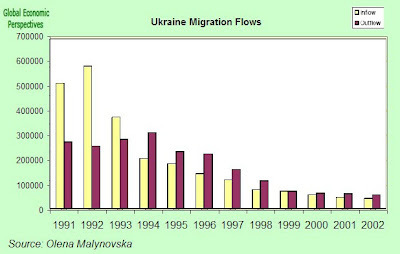 The second migratory phase -1994 - 1998 - was characterized by a very sharp reduction in the inflow to Ukraine from former USSR republics and a steady increase in the volume of outflow which lead to a migratory deficit in Ukraine of 91,600 in 1994. Altogether, over five years, more than 900,000 people migrated from Ukraine to CIS and Baltic states, whereas only 630,000 immigrated into the Ukraine. This is undoubtedly a reflection of the serious economic crisis which took place in the Ukraine during this time. The vast majority of Ukrainian emigrants at this time went to Russia (636,000 people in five years or 70% of those who went to the post- Soviet countries), since the economic situation there was better, wages and the standard of living higher and entrepreneurial conditions more favorable. Only 270,000 people arrived from Russia, i.e. 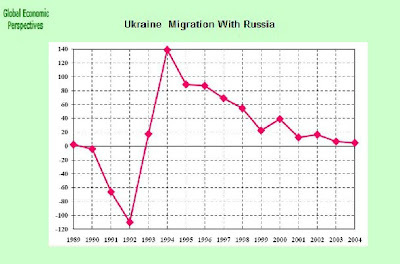 the migratory deficit caused by migration to Russia in 1994-1998 was about 366,000. This whole position can be clearly seen in the chart below which comes from the research of Olena Malynovska (full reference below). And the specific situation vis-a-vis Russia can be seen in this chart, which comes from data supplied by Pirozhkov and Safarova (see full reference below). The volume of population migration between Ukraine and the CIS and Baltic states has decreased significantly since the turn of the century according to the official statistics that register changes of residency. Thus in 2002, the volume of gross-migration was only one eighth of that registered in the early 1990s. 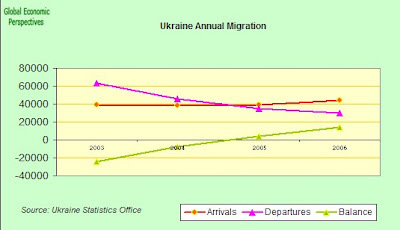 This transition is also clearly reflected in the Ukraine official migration statistics which form the basis of the following chart. The third phase in the migratory process began around 1999 continues today. This phase is distinguished by less intensity in the migratory process itself (to date) but also by a significant change in destinations. From migrating East the Ukranians are now moving West. Data on this latter movement has not been systematically collected but we have some national data on Ukranians in Portugal, Spain and Italy, and lots of anecdotal information about Ukranian migrant workers in Latvia, the Czech Republic, Poland and elsewhere in the EU 10. In the early 1990s, migration patterns in Ukraine were dominated by repatriating Ukrainians and Russians, Kazakhs, and other Soviet nationalities departing to their titular states. By mid-decade the makeup of migrants began to shift. Although the Ukrainian economy provided few incentives for migrants from the former Soviet Union, migrants from ethnic groups who had not historically resided in Ukraine continued to arrive, and in larger and larger numbers. These migrants came from Asia, Africa, and the Middle East; they arrived through legal, semi-legal, and illegal channels; and they were often on their way to Europe or other destinations. As Ukraine’s borders with Eastern Europe and the European Union solidified, it became more and more difficult for migrants to cross into Europe, and many found themselves in Ukraine for the medium to long term. According to official statistics, in 2001, 101,268 foreigners were registered with the Ministry of Internal Affairs in Kyiv. These include foreigners with permanent residency status on business and work permits, students in the city’s colleges and universities, refugees and asylum seekers, and illegal migrants who have been identified by the city’s law enforcement agencies. These figures surely miss a number of illegal migrants who have escaped the notice of city authorities. According to estimates of social scientists working on migration in Kyiv, approximately 15,000 of these foreigners represent ethnic groups that were not present in Soviet times – in particular migrants from Africa, Asia, and the Middle East. Kyiv is a microcosm encompassing many of the issues created by new migration trends in Ukraine. Changes to the city’s functions (from capital of a Soviet republic to capital of an independent nation) and the consequential shifts in legislation and jurisdiction of particular agencies left an opening for migrants to find their place in the city. The development of a robust shadow economy provided space for immigrants – even those with incomplete or no documentation – to find accommodations and employment. Ukraine’s willingness to accept immigrants and refugees and to offer them many of the same rights as citizens also made Kyiv a welcoming home for many. Added to this, Kyiv has become an important transit point where international routes for the transportation of illegal migrants from Asia and Africa intersect. The issue of migrants in Ukraine’s cities and towns is an interesting avenue of research for those looking at civil society development. In Kyiv alone there were nearly 500 national and regional ethnic cultural associations who were active in 2000. However, as well as the flow of migrants into Ukraine who decide to stay, we can also identify another group of migrants who enter Ukraine, and those are the transit migrants. These are normally destined for points further west. According to the Ukraine-based International Centre for Policy Studies(see reference below) the ethnic composition of transit migrants has also been shifting in recent years. In 2003, the majority of transit migrants were Southeast Asian and African nationals. Today, the majority of transit migrants are CIS nationals. Most significant among these are Russian nationals of Chechen origin, Moldovans, Georgians, Uzbeks, Azeris, and Armenians, accounting for 70% of total numbers of detained illegal migrants. What we can see, is that the numbers of Ukranians currently working outside their country is large, and as the labour market needs of the receiving countries increase this number will undoubtedly rise. The numbers of those now arriving may also be large, but possibly not as large as those who are leaving. This finding (and there are of course questions about the level of accuracy of all the data we have) is consistent with the very tight labour market position which we are now about to examine. As we have seen in Latvia, Poland, Romania etc, this whole process is very dramatic for the countries concerned (and not least of these for cultural reasons) and the stability and sustainability of everything which is happening (and so fast) must be under question. At just over 39, this is not especially high in comparison with elderly societies like Japan, Germany and Italy (median age circa 43), but it is very high when you consider the state of economic development in Ukraine, and when you consider the comparatively low life expectancy. This is another of the "details" about Ukraine's demographic and socio-economic evolution which worries me deeply, and if you are not really at all sure why the issue of median ages should matter to economists, well you could try this post here. Obviously such diversity at the level of key demographic indicators leads directly to divergence in terms of the comparative population age structures. Ukraine has a very low proportion of young children (for Ukraine in 2003 this group was only constituted 15.8% of the entire population) and a quite high proportion of elderly people(the over 65s constituted 21.3% of the total population in 2003). Nowhere is this problem clearer than when we come to look at the 25-44 age group as a percentage of total population. This group is critical since in many senses (credit acquisition, home establishment, productive prowess) it is the group which carries the economy on its shoulders. Now this data is very, very strange. In the first place after peaking in 1994 the group hovers around the 28% mark (you need to go into decimal points to see the changes) and secondly the level at which it peaks (28.95), since this is extraordinarily low. If Ukraine had had a more "normal" population evolution this figure should have been four or five points higher (say 33/34%). This gives a measure of Ukraine's lost population, and of the wealth creating capacity which has gone with it. Ok, so now lets have a look at some of the consequences of these structural distortions in the demographics. Let's start with the labour force. So as we can see the numbers of those employed has steadily increased, while the size of the economically active population is steadily dropping. This has its direct reflection in the unemployment data. Here are the unemployed as a % of the economically active population. There is nothing especially spectacular to note about the above data, except that the total numbers of employed persons does not rise enormously, moving only from 20,270,000 in Q1 2005 to 20,537,000 in Q1 2007. Thus despite the fact that the Ukrainian economy is growing steadily, employment is not rising to anything like the same extent, at least as far as the official sectors of the economy go. In part this may (hopefully) reflect some sectoral shifts, and some consequent increase in productivity as people move from less productive to more productive sectors in terms of value added. ( Of course it would be really, really nice to have a comparative skills balance sheet on this). 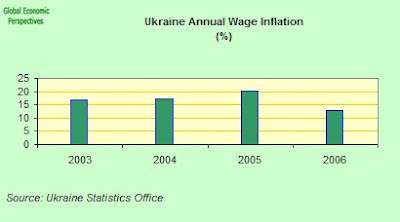 But the lack of new job creation must also in part reflect the labour market tightening - and hence wage inflation - that is taking place inside Ukraine itself. Wage levels - at least from the official data - seem to be rather volatile, but the trend is undeniably up, and seems to be running at an annual rate of increase of around 20% this year. Meantime the number of those who are unemployed heads steadily down. An idea of the velocity of this decline in the numbers of unemployed can be gained from the next chart which shows the monthly change in the numbers of unemployed for 2007. I have used the numbers registering with the employment agency as unemployed for this chart as there are, as in the case of most Eastern European countries, difficulties in getting through to the true meaning of the regular unemployment statistics. Still, this is a measure, and does give some indication of the tightening which is taking place. Total numbers of registered unemployed have fallen now from 790,000 to 595,000 in just seven months. At this rate of expansion Ukraine will run out of labour serviceable labour soon, very soon. The impact of this rapidly tightening labour market in Ukraine is, of course, not hard to predict: wages have been rising rapidly. 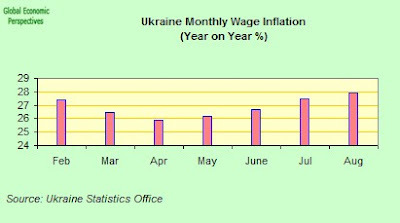 Here we can see the rapid rate of wage inflation which there has been in Ukraine over the last few years. And here's a chart showing the monthly rate of wage inflation since February 2007 (percentage increases in comparison with the same month in the previous year). As can be seen, the rate has been accelerating since May as the labour market has steadily tightened. Now one solution which is often advanced to this kind of problem is to try and raise the level of labour market participation (See the from Red to Grey World Bank report). So let's take a look at the Ukraine labour market participation rates for different age groups. First for males. As can be seen the rates of participation in the core age groups are already very high. Even in the 50 to 59 age group they are up around 70%. The only male groups where more workers really could realistically be found are in the 15 to 24 group, and in the 60 to 70 one. But a number of things need to be said here. Firstly, male life expectancy at birth in Ukraine is only around 63, and while life expectancy at 60 is likely to be somewhat higher this age group generally (at least for males) are hardly likely to be "hail and hearty" so I think it is unrealistic to imagine we can see a large number of extra workers coming from this group. If we look now at the 15-24 age group, it is important to bear in mind that this is a comparatively small cohort of people. In total this year there are around 7.25 million. Around half of these are males. This gives about 3.6 million, and 40% of these are already working. So we are down to around 2 million males in this group not working. But many of these people are in school, or tertiary education. So at a really optimistic guess you could find another half a million people here if you really tried. 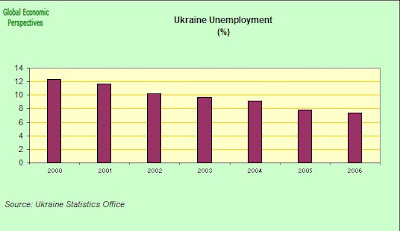 But the Ukraine labour market appears to need 200,000 extra people every six months, judging by the recent reduction in unemployment. Now obviously these are just very rough and ready back-of-the-envelope calculations, but they are simply to give an indication of the of the magnitude of the problem and the realism of those who simply talk about increasing participation rates without looking at the reality which lies behind the surface in a country like Ukraine. Well, across the board these are rather lower than in the male case, but even in the female case the central core age groups have reasonably high participation rates by international standards. There is of course the 15 to 24 age group, but I think here we need to remember, apart from the fact that many young Ukranian women want and expect a reasonable education just like their male counterparts, that Ukranian women still have children comparatively early (around the age of 23) and hence we need to be coherent here. In the longer term the future of the Ukraine rests on having more children, so we should not be simply eating the seed corn now by trying to extract the maximum levels of young female labour force participation, we should be dynamising policies which make it easier for them to have children. So we are left with women in the 50 to 59, and 60 to 70 age groups. This is fine - although do remember that some of these will have responsibilities as grandmoms if you want a higher proportion of the young mothers to be out working, so even here there are limits, and again being realistic, it is hard to see the white heat of the new technological revolution being brought to Ukraine by a group of poorly educated Ukranian women in their sixties. Well, as I said at the start, the Ukranian expansion is thundering along at the moment on the back of a major global expansion in the demand for steel. This is producing a consumer boom, which is reflected, for example, in the rate of expansion in retail sales this year. These, as can be seen below, have also really been thundering along at a huge monthly year on year rate. One of the factors which has been fueling this consumer boom has been wage inflation, another has been worker remittances, which have been increasing steadily in recent years. 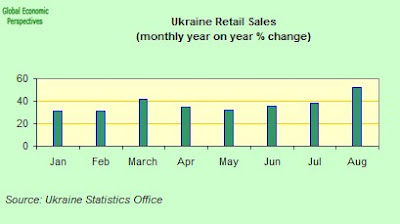 Here is some data which is now provided by the National Bank of Ukraine, but it should really be borne in mind here that these numbers can only be taken as an indication since the actual level is undoubtedly much higher. The Polish National Bank, for example, has actually, following all the notoriety which the "Polish in Britain" phenomenon has created started to make a pretty serious attempt to compile accurate data. 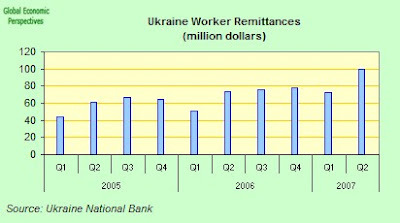 According to the World Bank Poland has measured 785 million dollars in remittances for 2006. The Ukranian National Bank only estimates 34 million. Even accepting that many Ukranians are still in Russia and on Russian wages, can Ukranian labour be worth that much less than Polish labour, especially when we take into account the number of Ukranians in Italy, Spain, Portugal etc. Even little Moldova manages to find $85 million coming in in 2006. 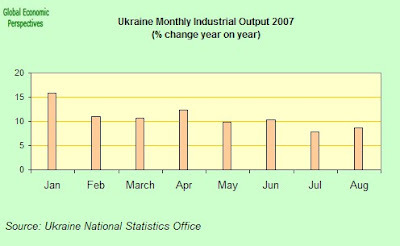 Apart from helping generate a mini construction boom (12.7% annual increase in construction activity Jan to June 2007 over the same period in 2006, and again where are the workers to come from to do all this specialized work), this consumer driven boom is creating imbalances in Ukraine's external trade as imports are rapidly sucked-in to satisfy all the extra domestic demand. 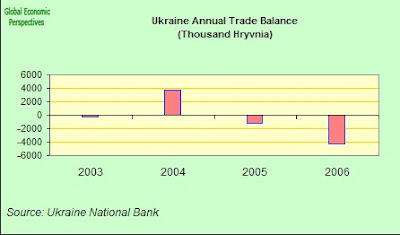 The Ukraine trade balance has, in fact, steadily deteriorated since the end of 2004. 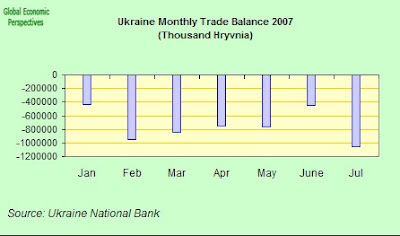 As can be seen from the monthly balance for 2007 below, this situation has continued as the year has progressed, and in some ways even deteriorated. I would like to close this post by stressing a number of basic points. Basically there is a danger here of interpreting what Claus and I are saying about the whole labour market situation across Eastern Europe in a very crude fashion, and we are anxious that people do not do this. The rate of labour market tightening (and hence inflation) across all of Europe's economies depends in part on available labour. This affects those in the EU (like Ireland, the Uk, and Spain) just as much as it does those who are outside (like Russia, Croatia, Ukraine etc). The extent to which this tightening (and hence the wage inflation and the exhaustion of reserve pools) occurs will depend on two things. Firstly it depends on the rate of economic growth, and secondly on the rate of sectoral transition to higher value activities. Both of these are semi-independent variables which cannot be predicted from simply looking at population numbers and fertility. But they are only semi-independent, since lower population levels and ongoing low fertility (ie over 20 years or more) do have an impact on the relative price of labour. This impact that the combined effect of this double whammy has is to slow growth, and to encourages a transition to more capital intensive activity (as labour becomes more expensive). It should miss no-one's attention that just this sort of discussion is already taking place inside China, as people begin to worry that the cheap labour intensive product era may be coming to an end as labour market tightening begins to have an effect even there (and here). So the both the immediate and the long term future for Ukraine look none too promising, and fraught with difficulty, from a demographic point of view. Especially when the majority of influential international agencies seem to ignore the fertility component in this problem. Unemployment has fallen substantially in virtually all EU8+2 countries since 2004 due to strong growth in labor demand. This has given rise to skill shortages and associated wage pressures, often amplified by out-migration of EU8+2 workers. However, employment/working age population ratios remain relatively low. Addressing the emerging skills shortages is particularly important, because failure to do so will constrain job creation and future economic growth. To increase the effective labor supply EU8+2 countries need to: (a) improve labor supply incentives through reforming the social security systems, (b) improve worker skills through reforming the educational systems and improving domestic mobility; and (c) import labor with skills that are in short supply by opening labor markets to foreign workers. There is much that constitutes sound sense in this report, although as I have already indicated it is not clear that labour force participation rate increases can do as much work in a country like Ukraine as they seem to imagine. What I found hard, very hard, to understand is why nowhere, but nowhere, in the whole report is the issue of doing something about the severe underlying fertility problem even mentioned. Ukraine’s Policy to Control Illegal Migration, International Centre for Policy Studies (Kyiv, Ukraine) and Institute for Public Affairs (Warsaw, Poland), June 2006. 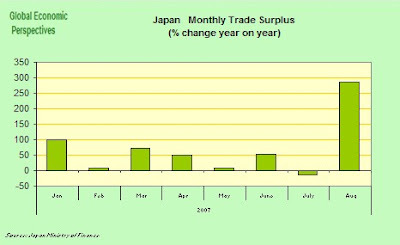 This post (together with Edward's last entry on the Japanese trade surplus situation) are the first installments of a series of "new-style" posts we will be having here at GEM. Traditionally has gone for more in-depth, detailed "x-ray crystallography" type, analysis of particular countries, regions or issues. 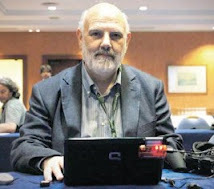 In part this has been done in conjunction with Manuel's excellent coverage of national election processes. However, since both Edward and I cover rather a lot of ground on a day to day basis, we are going to start bring some of the fruits of this to readers here in the form of short(-ish) research note posts. The first of these notes is on Japan, and the note is accompanied by a statistics-based charts-appendix from Edward at the foot of the post. What's With the Japan News, Is it Good or Bad? On the back of a miserable Q2 GDP reading and general uncertainty in markets Japan's economy has not exactly been the harbinger of pleasant data reading as of late, unless of course you have been short on the Yen. 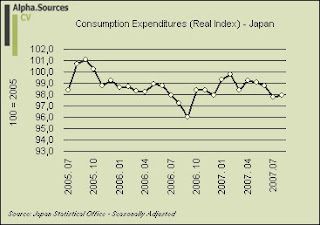 As I said in a recent small post on Japan Economy Watch this week was always going to bring some pretty interesting data releases from Japan in terms of figures for prices, consumption expenditures, industrial production and unemployment. In this short note we will take a look at the first two of these, and as prices, consumption expenditures arrive I will add the perspectives these latter provide in the form of updates to this post. Beginning with prices the overall picture did not change much in August with the reported benchmark index (general index excluding fresh food) staying flat at a -0.1% rate of deflation. The core-of-core which excludes both fresh food and energy rebounded to a rate of -0.2% from last month's -0.5%. So, this is indeed the case in point here and of course what this tells us about the underlying propensity to consume relative to where in fact the inflation pressures (if any) will come from. This perspective is especially important in so far as goes the potential for energy prices to rise quite significantly on a y-o-y basis in the latter part of 2007. Turning to readings on domestic demand we also from the basic headline reported in the media that domestic consumption expenditures rebounded to a 1.6% increase on a y-o-y basis. Now, compared to recent months' rather sub par performance this is indeed something of a rebound and for good measure I also reproduce the graph below which contains the figures which are widely reported by the media. However, since we are after all in the business of doing sound economic analysis (aren't we?) we might also want to look at some more solid measures of the trend in domestic demand. First of all it might be a good idea to incorporate some kind of seasonal adjustment to the data series especially since we are now, as can readily be seen from the graph above, moving into a territory where y-o-y nominal unadjusted figures are bound to get some headwind from what is clearly a rather distorting v-shape as domestic consumption apparently tanked in the middle of Q3 in 2006. In this way, why don't we have a look at the index-2005 series which is furthermore seasonally adjusted. As we can see below domestic consumption did indeed climb in August but in any way did it climb to the extent that we are led to believe. In fact, we see that general consumption expenditures still remain on a downward trajectory relative to the beginning of the year. This point is also further substantiated if we look at the real seasonally adjusted monthly series which again, without a doubt, show that August saw a climb but that the overall downward trend since the beginning of the year is confirmed. Finally, and to hammer my point down we could also go back through the underlying consumption indicators (Preliminary Report on the Current Survey of Commerce for August 2007) and take a look at sales for retailers, wholesale, and commercial sales. As Edward shows below, retail sales did in fact manage to clip in a 0.5% increase y-o-y but it also worth noting that total volumes of sales actually fell from July. In fact, if we look across the board total volumes of wholesale sales, commercial sales, retail sales, as well as sales from large retail stores all fell from July in total volumes in fact extending 3 to 4 monthly declines for all series. So this is just to say then that behind the reported headlines lies a reality which is a bit more differentiated than is often suggested. Moving on for a minute to corporate capex proxied by industrial production August saw a hefty uptick but we need to remember that this figure also somewhat has earthquake rebound written all over it. As I have hypothesised in my previous notes there is a risk that industrial production could begin to trend down as we move into the final months of 2007 on the back of the obvious downside related to the continuous specific role played by he Japanese export sector. ``Disposable income in Japan is not increasing, and the middle class is shrinking, which indicates that earnings at domestic companies are not going to improve,'' said Societe Generale's Nakagawa. So it seems that perhaps a new narrative is emerging here in relation to Japanese export dependence which is clearly, at this point, more than a passing trend before the Japanese economy 'normalizes.' Returning to the inevitable question, no I don't think that the BOJ will raise and I think that future data releases will solidify this call; for instance, I am not at all looking for something positive in Monday's release of the Tankan survey of business sentiment. Lastly and before I close up shop for good let me suggest address some general issues and quibbles I have. First off let me try to wave off the obvious. In this way I am fully aware that my analysis presented above could be seen as a deliberate attempt to talk down what in fact is good news on the Japanese economy. However, such accusations would be a mistake. What I do want to emphasise though is the need to look at the data that is actually in front of us and then to apply sound analysis based on whatever theoretical framework we have to work with. Now, this latter part is of course important and I realize that not all share my view of things which is of course fine. But at the end of the day we should all be interested in progressing with empirical vigour which is what I have attempted to do above. METI have just released the latest retail sales data. 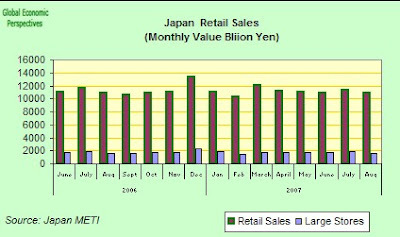 The yen value of both retail sales and sales at large stores actually fell from July, although total retail sales did manage to eke out a small 0.5% increase year on year, which was notable since in 9 of the previous 10 months they have actually been down even year on year. 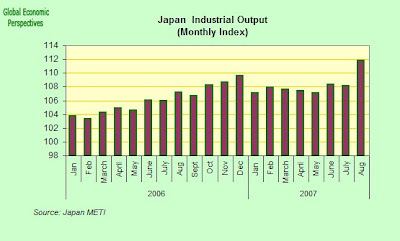 Industrial output was certainly up in Japan in August. Japan's industrial output surged at the fastest pace in almost four years....Production rose 3.4 percent from July to a record, the Ministry of Economy, Trade and Industry said in Tokyo today. Japan’s jobless rate rose for the first time in 11 months as more people sought work, underlining concerns about the slow pace at which economic growth has translated into higher wages. The unemployment rate rose 0.2 point to 3.8 per cent in August, while the job to job-seekers ratio deteriorated slightly from 1.07 to 1.06. The unemployment rate for women rose from 3.3 per cent to 3.7 per cent, according to official figures released on Friday. 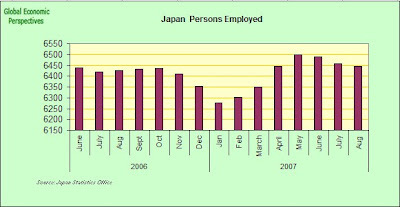 Also the number of persons employed dropped back slightly. As can be seen from the chart this seems to have peaked in May. 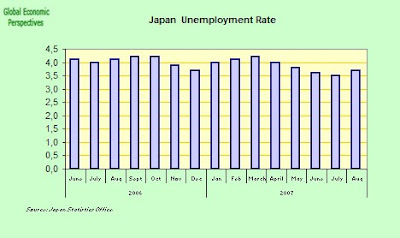 A much fuller analysis of the recent dynamics of the Japanese labour market can be found in this post. 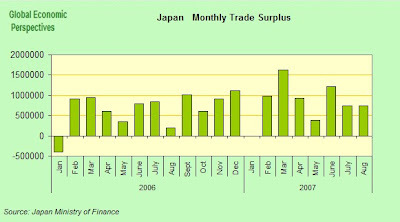 Japan's August trade surplus widened to 743.2 billion yen ($6.5 billion). On an annual basis exports rose at more than twice the pace of imports, according to the latest data released by the Finance Ministry today. The surplus has nearly quadrupled - and increase of 287% - from this time last year. The big difference between July and August is that imports held up in June, while they dropped back in July. 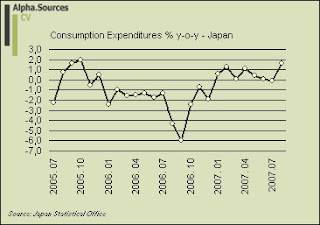 This is undoubtedly the impact of two factors, slowing domestic demand in Japan itself and fluctuations in energy costs. In fact petroleum imports did drop back from 1,137,199 million yen in July to 1,081,920 million yen in August, a drop of 55 million yen or so, or some 50% of the change in the balance. So as we can see, the August trade surplus was not particularly large at all, but experienced a fairly large annual increase due to the fact that the August 2006 surplus was very small. Economic data are full of anomalies like this. The situation becomes even clearer if we look at the monthly year on year changes in the surplus since January this year. The anomalous nature of the August reading becomes even clearer, and we shouldn't take it as a reading on anything very special. Now for some more interesting data. Exports to the EU, the US and China. 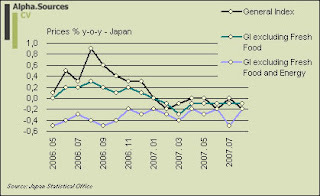 What we should note from this chart is that while exports to the EU have held up reasonably well since the start of 2007, and while they have been strong to China, exports to the US have been wobbling notably, which is understandable once you take into account the relative decline in the dollar (although not especially against the yen) and the fact that the US economy has itself started to wobble. In this context it is interesting to ponder what might possibly happen if the yen were ever to appreciate notably against the Chinese yuan. At the present moment however this eventuality seems rather unlikely and the yen was trading at 114.91 per dollar at 12:34 p.m. in Tokyo up from 114.57 before the report was published, but still within an acceptable range from the Japanese export point of view. 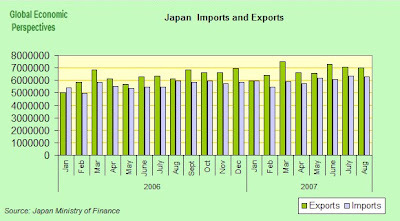 At the end of the day, and given what we know about the Japanese economies dependence on exports the future evolution of the export data will be crucial for determining just how well the Japanese economy is able to weather the storm caused by cooling global economic growth following the financial turmoil associated with the crisis in the U.S. subprime mortgage market. So going back to our charts, rather than simply reading Chinese tea leaves, my feeling is that we need to keep a close eye on the evolution of Japanese exports to those three big customers - the EU, the US and China - if we want to get an early indicator of whither the Japanese economy is headed at this point. As Bernanke chooses to cut 50 basis points and as economic growth is visibly slowing in Europe and even contracting in Japan I don't think many of us expected the BOJ to raise rates. 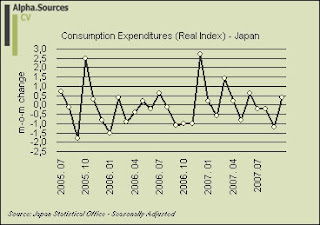 As such, Fukui and his colleagues duly chose to stand firm yet again yesterday as the economy contracted in Q2 2007 and remained mired in deflation. In this way it indeed seems as if Fukui is going to find it mighty difficult to end his term at the BOJ on a hawkish stance. The official decision by the BOJ can be found here (PDF!) as well as the accompanying statement from which I quote below. 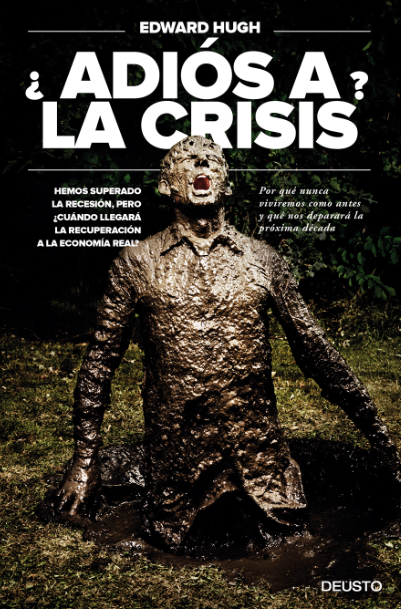 Public investment has been sluggish. Meanwhile, exports have continued to increase, and business fixed investment has also continued to trend upward against the background of high corporate profits. Housing investment has fallen lately. Private consumption, however, has been firm in a situation where household income has continued rising moderately. With the rise in demand both at home and abroad, production has continued to be on an increasing trend, although it has been flat most recently. Exports are expected to continue rising against the background of the expansion of overseas economies as a whole. Domestic private demand is likely to continue increasing against the background of high corporate profits and the moderate rise in household income. In light of these increases in demand both at home and abroad, production is also expected to follow an increasing trend. Public investment, meanwhile, is projected to be on a downtrend. Clearly the main narrative above is riddled with hedging and essentially a lot of word salad given the actual trend we are seeing but this I think is the normal nature of these kinds of statements. People should be clever enough to make up their own minds based on the present data. However, I do think that it would be a mistake to interpret the above as a sign that the BOJ will find space to raise rates anytime in the remainder of 2007. Of course, markets don't agree with me completely :) and thus seem to have a bit of difficulties finding their feet at the moment or at least this is the way I choose to interpret the fact that yields on Japanese notes actually rose on the back of 'bad-boy' Atsushi Mizuno's consecutive dissent in the BOJ's voting which is seen as a forward looking sign that the BOJ might just raise before the end of 2007. Clearly, the Fed decision in itself will have had something to do with this but as for the expectation of a BOJ hike in 2007; well, here is to hoping but I fear that this indeed constitutes a fools hope. For a general overview of the recent economic data and commentary on Japan you can check out the latest posts on Japan Economy Watch which almost constitutes a veritable tableau de noirceur over the recent slowdown in Japan. 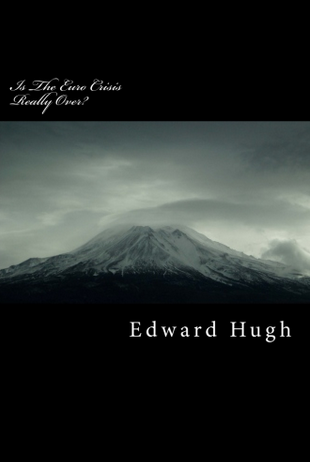 Furthermore, I recommend you to stay in touch over at Japan Economy Watch where yours truly, Edward Hugh as well as Scott Peterson are always busy to keep you up to date on Japan. Lastly, I also want to endorse the excellent Japan Economy News Blog maintained by Ken Worsley which also presents a never ending stream of commentary and analysis on the Japanese economy and society. In fact, you could even say that between Worsley and the JEW team you don't even need Bloomberg, the FT etc. Ah well, that is of course for you to decide.